VCE English for Success Units 3 & 4 eBookPLUS (Online Purchase) provides strategies and learning activities to lead students through the development of the skills in reading and responding, creating and presenting and using persuasive language needed for success in VCE English. • Detailed coverage of the three Areas of Study. • Emphasis on metalanguage that enables students to build confidence in understanding the subject matter that forms the basis of the Study Design. • Presentation of extracts from a wide range of popular novels, plays, non-fiction, media and multimedia texts with associated learning activities. • Links to interactive worksheets, writing tasks, annotated sample essays and other valuable materials in the resources tab. • Sample responses to assessment tasks, often annotated, provide strong models for students to emulate and thus improve their outcomes. 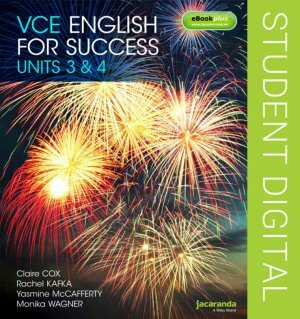 VCE English for Success Units 3 & 4 eBookPLUS is available as a digital-only resource that provides access to all the course content plus a wealth of multimedia resources accessed through our JacarandaPLUS website (http://www.jacplus.com.au/). Chapter 8 – Whose reality?